Surprisingly, I got out of bed on a Saturday morning. I felt bad that J and I really hadn’t been able to spend anytime together over the past week so even though I only got five hours of sleep, I got out of bed so J and I could run some errands. After a few quick stops, we ended up at the Kalamazoo Farmer’s Market. We got what we needed there then headed for lunch. The only problem is that we didn’t really know where we wanted to eat. 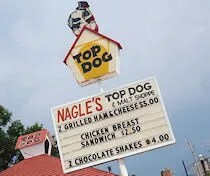 As we were leaving the Farmer’s Market, I saw the sign for Nagle’s Top Dog. We had never eaten there, so I asked J if it was ok if we tried it out. 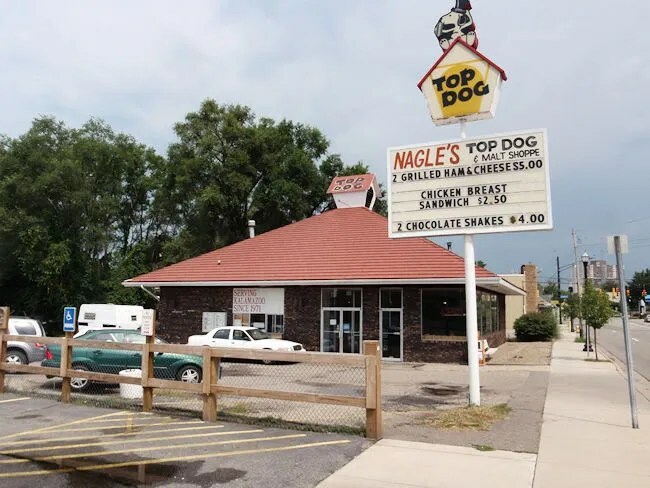 Nagle’s Top Dog is on Burdick just south of Crosstown Parkway. The place is kind of a dive that looks like much hasn’t changed in forty years. There’s a drive up window on one side of the very small parking lot and the roof is crowned with a dog house. We headed in to find the order counter immediately to the left when you come through the door. The menu consists of classic American food sandwiches and hot dogs. I’m told their claim to fame is the breakfast sandwich which is served all day. I considered it, but I wasn’t in the breakfast mood. Instead, I ordered Bacon Cheeseburger. It’s nothing fancy with a quarter pound patty served on a warm bun with two bacon slices, American cheese, onion, pickle, ketchup and mustard. The surprising part of the sandwich was the bacon. It was two very crispy, very flavorful slices of pork. 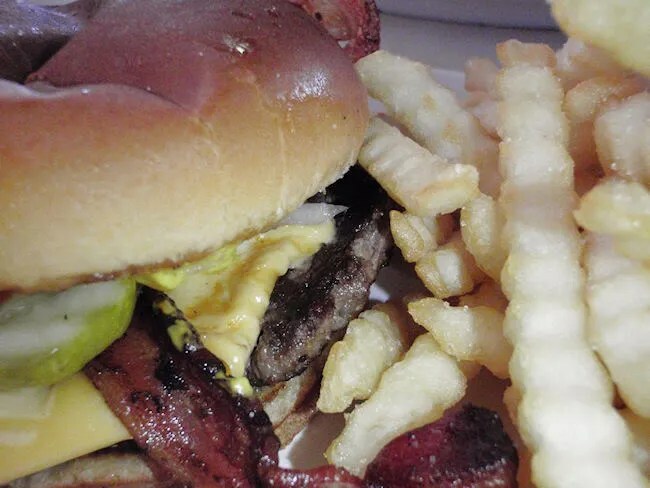 The burger itself was a pretty standard greasy spoon patty which I always love. To compliment my burger, I also got an order of fries. They too were pretty standard greasy spoon fries, but cooked crispy and with a little salt, rounded out this tasty diner meal. J ordered the Grilled Cheese sandwich. Like my meal, it was nothing fancy, but put together really well. 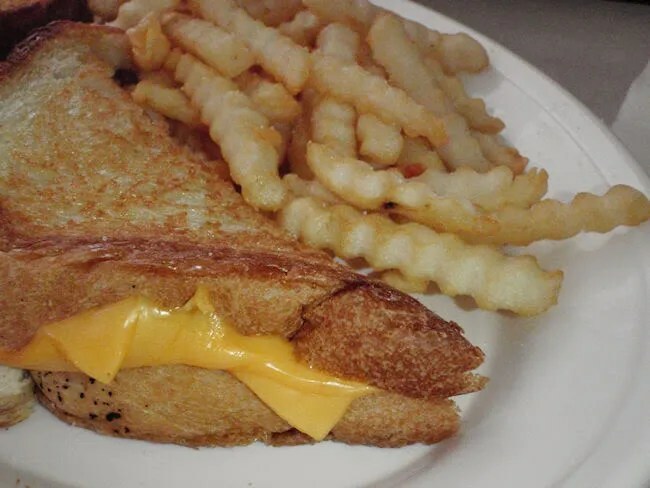 The cheese was sandwiched between two slices of thick bread and grilled to a nice golden brown crust. She also got fries with her sandwich. While Nagle’s is kind of a dive, it definitely has it’s own charm. Our food was served on real plates and the windows are lined with old paper back books which you can buy for less than a buck. We don’t do coffee, but I noticed a couple of the other tables where people came in just to grab a cup and read the paper. The coffee, like theplates for food, is served in real coffee cups. Our bill, with two soft drinks, was just a bit over $11. Nagle’s is what it is. It’s good, greasy diner food. Some people have told me they only go their for the hot dogs. Others have said the Breakfast Sandwich is something they crave. I didn’t have either, but I was happy with my meal and very happy with the price. Do you happen to know the hours?